See the sights of downtown Portland by Segway, and learn about this hip yet historic city from an expert local guide! Choose a 1.5-hour waterfront sightseeing tour, or a 2-hour historical downtown tour, for a ride through the streets of central Portland and along the Willamette River on a self-balancing electric Segway. Make stops at top Portland attractions like the Steel Bridge and Chinatown, and learn about the city’s industrial history. 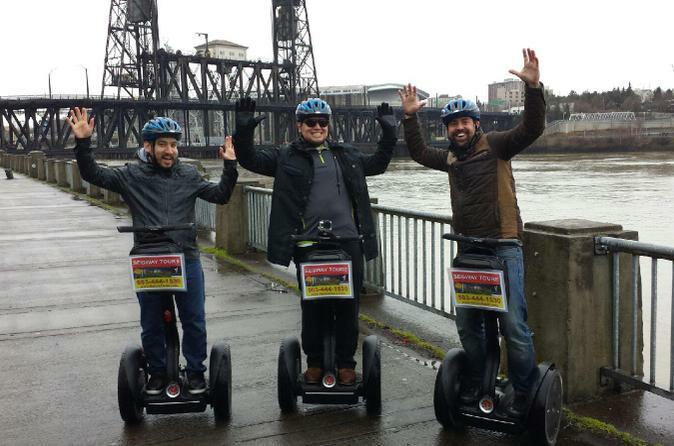 After checking in at the local operator’s office in Portland, just a couple of blocks from the Willamette River, your Segway tour begins with training to make sure you are comfortable with your electric, self-balancing two-wheeler. When your group is ready, follow your guide and enjoy your 1.5 or 2-hour city Segway adventure! With your local guide, travel effortlessly by Segway along the west bank of the Willamette River, stopping at times to take photos and hear stories and fun facts from your guide. Make your way to some of Portland’s most popular attractions such as Chinatown, an area that is listed as part of the National Register of Historic Places. Admire the Steel Bridge, a double-decker vertical-lift bridge spanning the Willamette that is one of Portland’s most-loved landmarks. Then check out Waterfront Park, a favorite local spot for jogging, biking and enjoying the fresh Oregon air. Pass by city sights like the Jeld-Wen Field, home of the Portland Timbers soccer team; zip by the Portland Art Museum, the oldest museum in the Pacific Northwest; and glide through the Central Business District with its historic buildings from the early 1900s. On this downtown Portland tour, see most of the same sights along the Willamette as the 1-hour tour, plus even more attractions like the Portland marina, the convention center and the Moda Center, home to the Portland Trail Blazers professional basketball team. Many of the historical attractions you’ll see are in the city’s popular Pearl District, a former industrial neighborhood that’s now an upscale shopping and dining district. Ride past warehouses that are now home to art galleries and boutiques, and watch the streetcars go by. During your tour, your guide will make stops so you can take photos and hear historical commentary. Return to the starting point at the end of the tour.